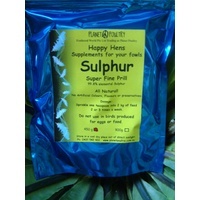 Sulphur super fine prill - 99.8% elemental sulphur. Dosage: Sprinkle 1 teaspoon into 2kg of feed 2 or 3 times a week. Do not use in birds produced for eggs or meat. 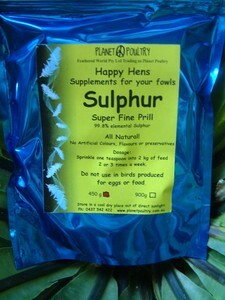 Natural Antibiotic & Pest control , Poultry, fowls, bantams, chooks, chickens, chick, hens.